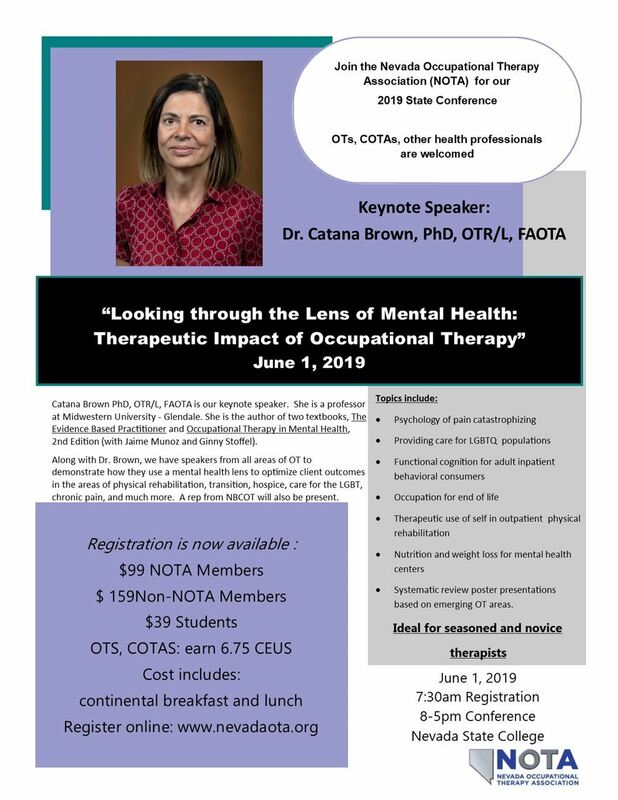 Keynote speaker Dr. Catana Brown PhD, OTR/L, FAOTA, is a professor at Midwestern University - Glendale. She is the author of two textbooks, The Evidence Based Practitioner and Occupational Therapy in Mental Health, 2nd Edition (with Jaime Munoz and Ginny Stoffel). Her practice and research focuses on promoting satisfying community living for individuals with serious mental illness. She is the primary developer of the Nutrition Exercise and Weight Loss for Recovery (NEW-R) program and the Adolescent/Adult Sensory Profile. We seek to advance and advocate for the profession and practice of occupational therapy. We also strive to further educational opportunities, increase professional engagement of occupational therapy practitioners, promote evidence-based practice, and align ourselves with the practice standards established by AOTA. Please email nevadaota@gmail.com with questions. Mon, October 22, 2018 Earn 3 CEUs at Touro for the Systematic Review and Join us for Happy Hour! Tue, November 21, 2017 "Serving All Students: Integrating OT and PT into Multi-Tiered Systems of Support"